She Remodeled Her Laundry Room For Her Dog. Now? I’m Never Doing Laundry The Same Way. Right now I live in a one-bedroom apartment in the city, so when I’m ready to “upgrade” my house, I’m just going to settle for a place where the living room and kitchen are two separate areas. I’m thinking small for now. I have nothing on that Australian couple who are renovating an entire French château, and I’m not yet ready to put an entire wine cellar in the kitchen. Recently, however, I came across a new trend in home renovation and design that dog lovers are going to flip over. Usually, a laundry room will be one of the most overlooked rooms in the house, especially when it comes to renovations. After all, the laundry room is usually no more than a reminder of chores you have to do. But why not turn it into a fun sanctuary for your animals? It makes a ton of sense to me. Growing up, we always kept our schnoodle’s dog bowl in the laundry room. It was a little less unsightly than just leaving it out in the more public areas of the house. Imagine you’ve taken the dog out for a walk and it starts to rain. You get back to the house and your clothes are soaking wet, not to mention that the dog has probably become soaked and muddy too. What if there was a dog or cat shower right there in your laundry room? Think of the time you would save and the messes you would avoid. Some of these renovations may seem costly, but they’re fun ideas to imagine. And even if you can’t afford a whole house renovation (who can? ), some of these additions to the home may take less than an hour of work, but they’ll make a great space that improves the quality of your home and gives your pets a comfortable place to be. What do you think? Would you like something like this in your home? Let us know in the comments, and please SHARE with your friends. If you have extra cupboard space, you can turn it into a comfortable dog bed. 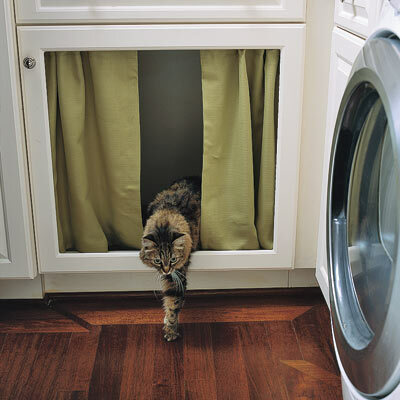 Additionally, by using stackable washer/dryer sets, you allow extra space for convenient dog showers. If your laundry room connects to the outside, prevent dogs from tracking in dirt and mud with built-in dog showers like this one. Dog showers like this can help keep your own showers and tubs a little cleaner, and will keep those drains less clogged with fur. There’s a variety of ways to add these types of amenities to a laundry room, and they don’t detract from the style of the house. Cat lovers are in luck, too. How many cats love to curl up near the dryer for the warmth and vibrations? Why not build them their own private cubby near the dryer? It’ll keep the fur off your newly cleaned clothes. Your dog’s bed can seamlessly be added to the decor of the house. And rather than have your pet’s dishes out on the floor where guests can possibly step in them or knock them over, clear cabinet space to make a cute nook for your pet’s bowls. It’s almost like they have their own dining room. Better yet: Why not build the bowls into their own drawer? Once you’ve built that dog shower, if you have a small dog, help them out by building stairs that pull in and out like drawers. This is definitely something I would like to add to my bed for my Boston terrier. You can build your own kennel for a dog right into the decor of your house. This is much more attractive than a large plastic crate just sitting out. For cat lovers, place your cat’s litter box inside of one of these shelves and cover with a curtain. No one has to see the unsightly sight, and your cat can get a little privacy. Please SHARE this incredible home renovations for pets! This Old Woman Visits Her Husband’s Grave, But Seconds Later? SHOCKING. Cat Knows It’s Time To “Go Home” But When His Owners Try To Pick Him Up, It’s Hilarious… Just Watch! State to pass law banning of buying junk food with food stamps. Do you support this law?